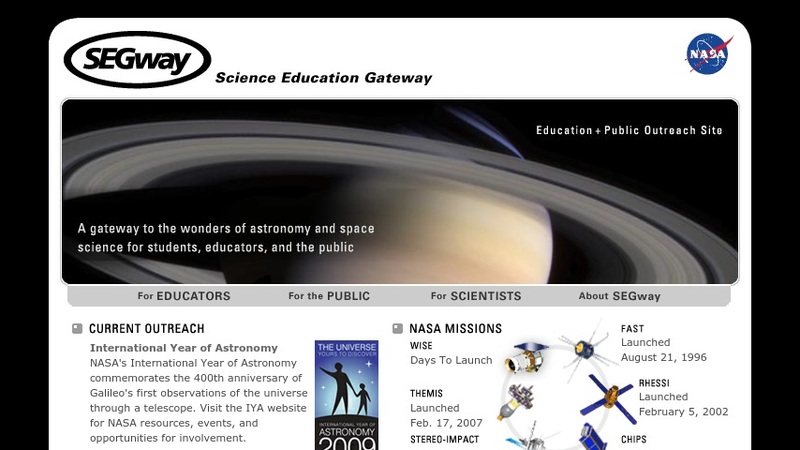 SEGway is a science education and public outreach (E/PO) organization of educator-scientists working to present the latest astronomy and space science research to students, teachers, and the general public. For educators, the SEGway web site features lesson plans and activities from SEGway and NASA; and links to educational standards from the National Science Educational Standards, Benchmarks for Science Literacy, and Principles and Standards for School Mathematics. For the general public, there are interactive features, videos, satellite imagery, information on NASA missions, and other resources on astronomy and space science topics. For scientists, there is information on SEGway's services as provider of E/PO programs for space missions.